One Of The Most Famous Selections Of Bhagavad-Gita is that in which Lord Krishna’s disciple Arjuna sees that Krishna’s body encompasses the entire universe. A prominent university scholar describes the universal form as “the mystery” of’ Bhagavad-gita. However, one can easily understand the universal form by studying the Gita through the testimony of Arjuna and the devotees who Follow him. Hearing of Krishna’s opulences, Arjuna declared, “You are the Supreme Brahman, the Ultimate.” Arjuna had testified, moreover, that although some might think that his friendship with Krishna had swayed his opinion, such great sages as Narada, Devala Asita and Vyasa—and all the Vedic scriptures—confirm that Krishna is indeed the Supreme. Nevertheless, so that his acceptance of Krishna as God would not be merely theoretical, Arjuna requested Krishna to reveal his visva-rupa or universal form. Krishna therefore agreed to reveal this form to Arjuna, and He blessed Arjuna with the special vision he needed to see it. Those who have studied Bhagavad-gita know that it is a dialogue between Krishna and Arjuna in which Krishna, the Supreme Lord, tries to convince Arjuna, His friend and disciple, to fulfill his duty as a warrior by fighting against a demoniac army. Throughout Bhagavad-gita, Krishna gives many arguments why Arjuna should fight, and He especially assures Arjuna that he and all the others in the battle are eternal spiritual souls who cannot actually be killed. In His universal form, however, the Lord tells Arjuna that even if he refused to fight, the material bodies of all the warriors would nevertheless be destroyed, for that was the plan of the Lord. If Arjuna refused to fight, they would die in another way; their death could not be checked. Thus Krishna explained to Arjuna the mission of the universal form. Although Krishna is the Supreme Lord of the universe, He enjoys eternal personal relationships with His devotees such as Arjuna. 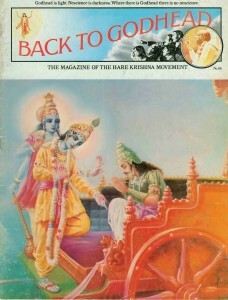 However, when Krishna appeared in His universal form. Arjuna, overwhelmed, begged Krishna to forgive him for all the personal familiarities of their friendship. Arjuna said, “I have in the past addressed You as my friend, Krishna, without knowing Your glories. Please forgive whatever I may have done in madness or in love. I dishonored You many times while we were relaxing, lying on the same bed or eating together, sometimes alone and sometimes among friends. Please excuse me for all my offenses. You are the father of the complete cosmic manifestation, the worshipful chief, the spiritual master. No one is equal to You, nor can anyone be one with You.” (Bg. 11.41-43) Thus although Arjuna, seeing his friend in the form of Time, was very much afraid, he could not forget that Krishna was his friend in a loving relationship. According to our spiritual master, the main reason Arjuna asked Krishna to show this form was to discredit imposters who might come later and claim to be God. 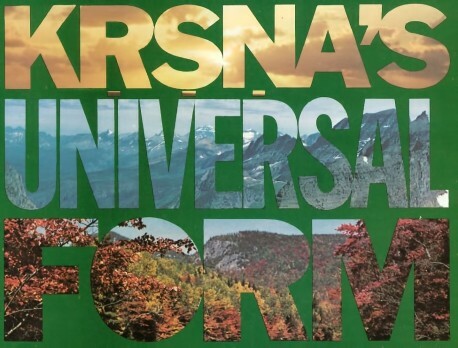 Many rascals boast that they are God or incarnations of God, but they should be challenged to show a form as wonderful as the visva-rupa, in which all the universes appear within Krishna’s body. No one but the Supreme Lord Himself can display such a form. Arjuna’s vision of the universal form was real; it was not a dream, for the Gita indicates that many other important personalities also beheld the universal form when the Lord revealed it to Arjuna. Moreover, since five thousand years ago, when Bhagavad-gita was spoken, great philosophers and spiritual masters have confirmed the reality of Lord Krishna’s universal form. Sometimes fraudulent Gods bluff their followers by asserting that they can indeed show them the universal form. One time a boy came to the Krishna consciousness center in New York and announced to the devotees that he was God. When asked to show his universal form, he declared, “Yes, here it is,” and then he held up his arms so that everyone could behold his cosmic body. But a display of mere insolence and a form of skin and bones—”Here it is. Can’t you see it?”—does not constitute a revelation of the universal form. Nor can word jugglery, LSD, hypnotism or charisma induce a true vision of the universal form. Only the Supreme Godhead can reveal that cosmic form, and as stated in the Gita only His pure devotees are qualified to see it. Some professors and scholars try to dismiss the universal form by saying that it is a poetic fantasy. Such an interpretation, however, is contrary to all the understanding of Vedic literature. These professors and their students may take Bhagavad-gita to be fanciful, but the real philosophers, the spiritual masters who come in the disciplic line from Krishna and who have guided the course of Vedic philosophy for thousands of years, accept Bhagavad-gita as the Absolute Truth. Mundane scholars do not know whether Krishna showed His universal form, but the acaryas (the spiritual masters who teach by the example of their lives) do know. That the tiny minds of atheists cannot accept such a wonderful manifestation as the universal form does not disprove its existence. The message of the Gita was spoken by Krishna, who showed the universal form, as clearly stated in the Gita itself. We accept the CIO as it is, on the authority of Krishna and the Vedic acaryas. Thus we need not consult foolish speculators for their opinions. Since they try to interpret Bhagavad-gita in their own way, they cannot possibly understand the universal form as it is. According to the Vedic scriptures, the Supreme Lord has innumerable forms and incarnations. Among them, the fourarmed form of Visnu is often celebrated as the foremost, for He is the source of many other incarnations and is the ultimate controller of the material world. Despite popular Western misconceptions, Visnu is not one of a hierarchy of Hindu deities like the gods and goddesses of the ancient Greeks. According to the Vedic scriptures, God is one without a second, but He can appear in many different forms, just as a gem appears in different colors when viewed under different kinds of light. Thus the Supreme Lord may appear as Krishna, as Visnu or as the universal form, but He is always the same Supreme Personality of Godhead. Krishna’s changing from the universal form to the four-armed form and finally to the two-armed form is most significant, for this demonstrates that all other forms are coming from the original form of Krishna. Many interpreters say that the universal form is the most important feature in Bhagavad-gita. Others stress the form of Visnu. Actually, however, Visnu and the universal form are but aspects of Lord Krishna as we see Him in His two-armed form when He drives the chariot for Arjuna. As stated in Srimad-Bhagavatam, Krishnas tu bhagavan svayam: Krishna is the source of all other incarnations of Godhead. In that humanlike form, He has such inconceivable potencies that He can expand into the whole universe. Therefore that original form is His most worshipable and most important. Furthermore, Lord Krishna, in His two-armed form, is the reservoir of all loving relationships. The Lord appears in various forms to create the material world and perform various pastimes, but in His original form as Krishna, the Lord fully reciprocates transcendental love with His devotees. To say that the impersonal spirit or universal form is more exalted than Krishna, the Personality of Godhead, is a great disservice to the meaning of Bhagavad-gita. Krishna’s humanlike form is His very Self, and there is no truth higher than Krishna. As stated in the Brahma-samhita, isvarah paramah Krishnah: Krishna is the Supreme Lord, the supreme controller. Govindam adi-purusam tam aham bhajami: He is the original form of Godhead. Therefore devotees desire to see Krishna in His two armed form, which is the most confidential form of Godhead. Srila Prabhupada has commented: “Those who deride Krishna, taking Him to be an ordinary person, must be ignorant of His divine nature. 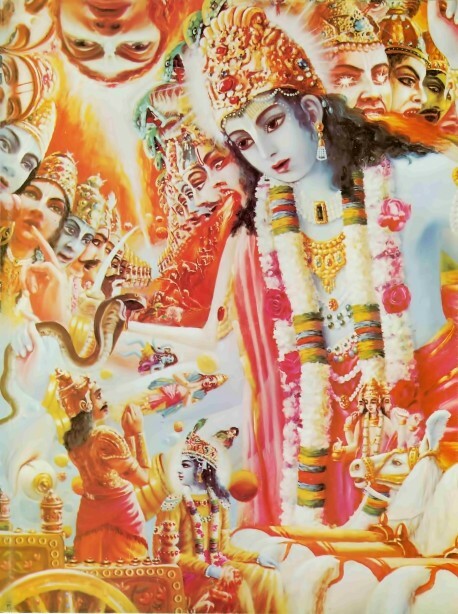 Krishna has actually shown His universal form and His four-armed form, so how can He be an ordinary human being?” Most editions of Bhagavad-gita unfortunately give interpretations that misguide the reader, but an actual devotee is not confused because the original verses of Bhagavad-gita are as clear as the sun. They do not require a lamplight from foolish commentators. In His original form, Krishna eternally reciprocates with His devotees as their master, friend, child or lover. The visva-rupa, however, is not an eternal form of Krishna, but a temporary manifestation to convince even a common man of the Lord’s almighty nature. Srila Prabhupada has said, “Don’t try to love the visva-rupa. It is not possible.” In the universal form, the Lord displays His opulence and power, but He does not reciprocate love with His devotees. Srila Prabhupada therefore gives the example that if a boy’s father is a policeman, even the boy himself might become afraid and forget his love if his father appeared before him, revolver blazing, in the line of duty. Similarly, Arjuna became fearful when he saw Krishna’s universal form. When Krishna returned to His pleasing two-armed form, however, Arjuna was fully satisfied. Lord Krishna displayed His universal form to inspire all men to fix their minds upon Him and devote themselves to Him alone. The universal form is meant to convince us that although Krishna may appear like an ordinary human being, He is indeed the allpowerful Personality of Godhead. Therefore Lord Krishna, not the visva-rupa, should be the object of our meditation and our love. He is the original form of Godhead, the reservoir of all beauty, knowledge, wealth, strength, fame and renunciation. Therefore when we revive our dormant love for Krishna, we also, like Arjuna, will find full spiritual satisfaction. I find this information very knowledgable to me.. It will help me in my project….